Mashed Libraries meets the season where adovacaat is a necessity. Except – Santa’s reindeer are different. 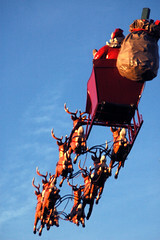 It is said that the reindeer that pull Santa’s sleigh on Christmas Eve can fly. Whether it is only on that one night, once a year, or whether they are special reindeer which can fly all year ’round (not that they need to) is yet to be determined. Pleased to see that they could answer my question I had a bit of a scout around and found so many unanswered Christmas questions on the site. How do you say happy christmas in maylasia? What is tradionaly hidden in the Christmas pudding? Who tried to steal Christmas from the whos of whoville in 1966 cartoon based on dr. seuss story? What year was the 1st christmas card produced? Who introduced Christmas trees to England in 1830? What are the recorder notes for Have yourself a merry little Christmas? What kind of gifts do scottish people give for christmas? Wouldn’t it be great if we (library and information bods) could answer as many of the unanswered questions on the site as possible before Christmas. It would be great to highlight the fact that the questions have been answered by Father Christmas’ Librarians. 🙂 I reckon this is a great opportunity just to show what great reference and information skills librarians and information professionals have. So, why not give a few questions a go?